In this unusual picture book, we meet Thinker, a small black and white dog who belongs to Jace. Both are members of a black family consisting of mum, dad, and sister Kimmy, but what makes this book of poems so unusual is that Thinker can talk, but his talking only consists of reciting his own poems. Jace is a poet too, and together they write all sorts of happy poems about the family, about school, about Jace’s sister Kimmy, and some that are philosophical too, about life in general and why things are as they are. The rhyming is unusual – some free verse, but with lots of internal rhymes, and they dance with rhythm and meaning. One is a haiku, and another is a rap. The book is a joyful story, and the highly engaging illustrations – collages, created with handmade and hand-coloured paper – are richly evocative. The publisher and both the author and illustrator are interested in portrayals of black culture and family life, and Ms Greenfield has been winning awards in the US for her children’s books for many years. This is her first in the UK. 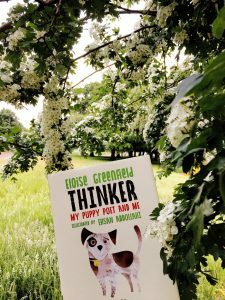 When Jace takes Thinker to school for pet day, he is a bit nervous that Thinker might talk, but when he does – because he can’t keep the poem inside himself any longer – the whole class and all the pets in it erupt with laughter and pleasure. We too, will erupt with pleasure when reading this delightful book.